Home » Rotis + More » “Carrot Cake” Roti: A Video! If you love the flavours of Carrot Cake, and want to whip up a healthy treat for breakfast, you can make these “Carrot Cake” Rotis. Yes, you read right, carrot cake and roti – in one. How? Well, mix in the carrot and the traditional carrot cake spices with roti flour of your choice and make rotis as usual. It’s really that simple. And The best thing about this recipe is that you get that lovely carrot cake fragrance and taste without any sugar or sweetener! I’ve added ginger and turmeric – unsual for carrot cakes – to this recipe because not only are they good for you but ginger goes well with carrot and turmeric adds an extra dash of yellow-orange to your rotis. As for accompaniments peanut butter (or any nut or seed butter) is great. For a completely different experience try it with coriander chutney and yogurt. Or even pickle! And now, for the video recipe! Thanks Sugarfree Sweetheart for this post! This is by far the cutest cooking video I have ever seen. Wow! It must have taken a long time to make. Great video. I enjoyed watching and will certainly try the carrot roti. Brilliant, great video guide, fab I love it. Priya, your video is ADORABLE. The music is a perfect match. I love it!! The video is beautiful! I cannot imagine the amount of work it would have taken to make it without the ‘human’ touch, or maybe you have the technology to make it? I’m trying these rotis tomorrow! It did take a lot of work, actually! It took almost two hours to film and several hours to edit to remove the ‘human touch’ as you said.. But it was worth it, considering you guys liked it! 🙂 Hope you enjoy making and eating these, Apsara! Priya – Love, love, love the video – it’s adorable and tells the story perfectly! The stove substitution was genius! A very creative take on a traditional recipe – hats off to you! And a very Happy Fiesta Friday – thanks for bringing these to the party! Aww, am thrilled that you noticed the “stove”! Made my day, Selma! 🙂 Happy FF to you too! Lovely to “meet” you! I am floored! You are beyond awesome!! So creative! Priya, if I say in punjabi…..dil Khush kitta wai :). Had fun watching the video. S crisp and so different. Pass me some tips..couldn’t tame the YouTube. Now to recipe : what an awesome idea my dear. Just superb. Totally worth it my drear :). Loved it. I love your video! So clever. and of course the rotis. Yummmm. My fave is almond butter, I bet that would be tasty! Happy Fiesta Friday! Wow, what a great and unusual combination of carrot cake in rotis – I’ll bet it is yummy! so good! happy Fiesta Friday! I loved your illustrations.. now these videos are cute too ..! Lovely recipe..! 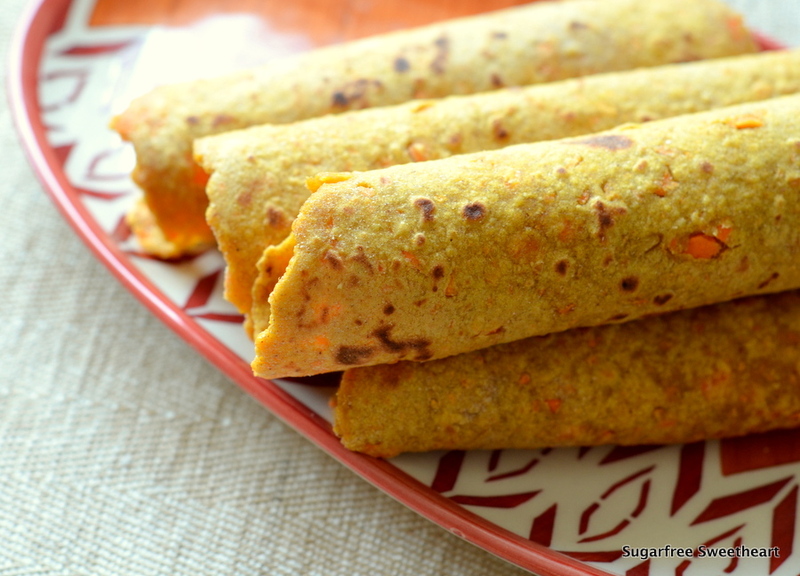 Carrot cake rotis? Genius.. Thanks for bringing them over! This is so brilliant! Never thought of making carrot cake and rotis as one. These rotis look so good! Thank you for bringing these to FF and for sharing a video. 🙂 Happy FF! Nice you “meet” you Jhuls, and thanks for dropping by! 🙂 Happy FF to you too!